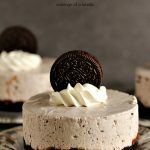 Simple to make and absolutely worth the indulgence and mess! 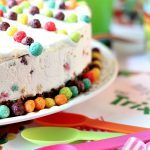 I wanted to share some easy recipes for ice cream that do not require an ice cream maker. 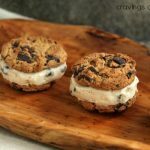 I have so many ice cream recipes on the blog that use one that I thought it would be fun to do a couple that don’t. This one is so easy to make, but I’ll warn you it’s messy like crazy. But totally worth it. Just keep some napkins handy. Line up 12 crackers on a serving platter, good side down. Melt the marshmallows in the microwave for about 1 to 2 minutes, checking often. Spread them evenly over graham crackers. Now warm up the hot fudge sauce slightly. You want it warm but not hot or your ice cream will slide right off the sandwich. Set aside. Cut the ice cream into squares. I buy the rectangular box, open it up and slice like I would with a watermelon. Seriously, works like a charm. Pay attention to size so the ice cream fits on the ice cream sandwich. Slide the ice cream on top of the marshmallow layer. Quickly top with sauce, and then top each one with a graham cracker. Serve immediately. It helps to have solid ice cream to start off with so you have time to work. Or get someone to help. This recipe requires quick work. 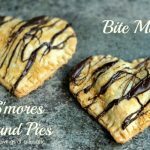 Serve with a big old s'mores loving smile! If you want to use s'mores flavoured ice cream you can use my recipe for S'mores Ice Cream. If you want a Chocolate Ice Cream recipe try my Chocolate Fudge Brownie Ice Cream. Ooey, gooey, and messy. This recipe rocked my world. I had ice cream, chocolate and marshmallows all over my camera after the shoot. I really hope you are enjoying ice cream week as much as we are! Now continue to scroll to enter the giveaway! 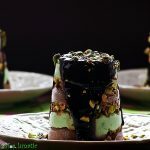 If you want to follow along with #IceCreamWeek follow my Pinterest Board: Follow Kim Beaulieu | Cravings of a Lunatic’s board #IceCreamWeek on Pinterest. My all time fave ice cream is mint chocolate chip! I would love to win all these goodies!! Now this is MY kind of a s’amore. No campfire to get started! I can have one in the middle of the night too. Ha. I forgot my say my favorite flavor—-Coconut—or lemon custard—-or maple nut—-or like I can’t make up my mind. No telling me I have to serve and eat quickly! Who’d ever want a regular s’more after tasting one of these decadent gems???? What a terrific idea! These looks scrumptious Kim, love them!! Also Kim, how could I forget, thank you so much for hosting!!!! Oh.My.Gosh! These look all kinds of amazing. It’s been too long since I visited, but these have me drooling! Pardon me while I pick my jaw up from the ground! OMG, I’ve never seen such a generous giveaway, and, like everyone else, hope it’s me that wins. Definitely looks like they are worth the mess! Arn’t s’mores always worth the mess? Oh man these look incredible! S’mores are my very favorite thing! I love, love, love rocky road! The bigger the mess, the tastier the food, that’s what I always say. And I LOVE eating with my hands. Just ask the Husband – I even eat bowls of rice with my bare hands all neanderthal-like. It drives him nuts. 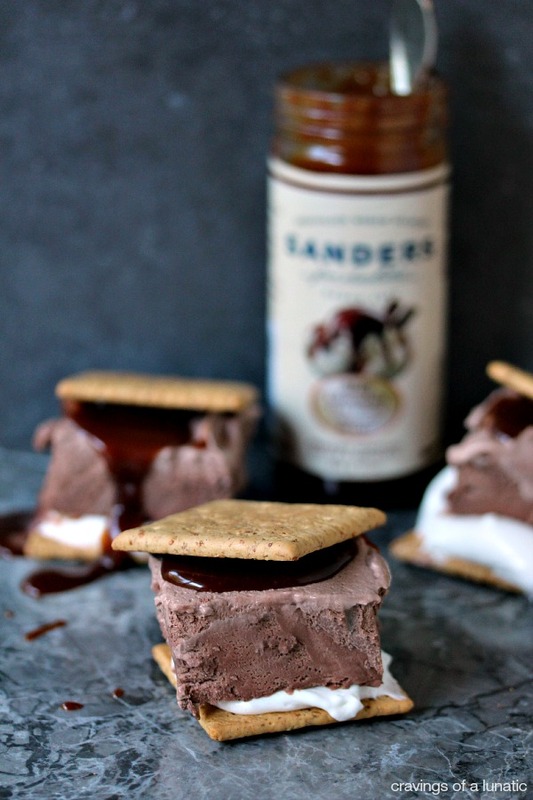 I would be ALL OVER these s’mores ice cream sandwiches. Love how messy and delicious these look. My favorite ice cream flavor is neopolitan! I mean….messy usually equals delicious in my experience. Especially when the messy thing is S’MORES ICE CREAM SANDWICHES! Be still my summer-lovin heart! My favorite flavor is Cookie Doughn’t You Want Some from Cold Stone! Thanks for the awesome giveaway! Oh yes… this is pretty brilliant! Those ice cream bowls are so adorable! Any ice cream with peanut butter in it is hard for me to resist.